Wolf and Bear Cub Scouts must complete Achievements in their Handbook. These Achievements cover these areas: God, Country, Family, and Self. You must complete the required number of achievements to earn the rank award. 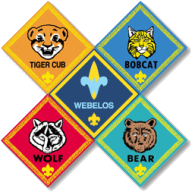 There are 20 Activity Badges a Webelos scout can earn. These are divided into 5 areas: Physical, Mental, Technology, Outdoor, and Community. A pin is presented for completion of each activity Badge. The Leader of the Pack. Does not have to wear leather or ride a Harley, although sometimes it helps. Usually the Cubmaster, but Akela also means Den Leaders and YOU--the main leader your boy looks to for guidance! This is the highest award a boy can earn in Cub Scouting. Also the only non-religious award from Cub Scouts which can be worn on a Boy Scout Uniform. Arrow Points are awarded to Wolf and Bear Cub Scouts fro completion of electives beyond the Achievements covered for earning the Wolf or Bear rank badge. A Gold Arrow Point is awarded fro the first 10 electives; A Silver Arrow Point is awarded for each successive 10 electives completed. Veteran Cub Scout, now in 3rd Grade. Been there, done that, and looking for action. Chooses his achievements, and looks forward to Webelos. Of 24 possible achievements they must complete the prescribed amount in each area, God, Country, Family, and Self, for a total of 12. Generally held in February to celebrate the anniversary of Cub Scouting. This celebration can be an annual pot luck dinner, banquet or whatever the pack decides to make it. Every boy who joins Cub Scouts must first earn the Bobcat Badge. Doing this, he learns the seven basic tenets of Cub Scouting: the Promise, the Law of the Pack the sign, the handshake, the motto, the salute, and what Webelos means. A Scouting magazine for boys to help broaden their horizons in Cubbing. A Boy Scout is between the ages of 11 and 18 and belongs to a troop. He advances through these ramks: Tenderfoot, Second Class, First Class, Star, Life, then Eagle. One part of the Safe Swim Defense. Swimmers of like ability are paired. Check in and out of the water together and stay within 10 feet of each other during the swim. It is also used on other Cub Scout activities for safety reasons. A geographical are, made of up districts for administration of the Boy Scout programs. We are part of the Daniel Beard Council. Any of a million or so boys between the ages of 6 and 11 who get together and have fun at Den and Pack meetings. Marked by curiosity, easy laughter, speed, and blue uniform. Likes to eat DingDongs and Bug Juice. Cub Scout Leader Basic Training is 6 hour training session that covers all basic information needed to be pack leader. The Cubmaster is the chief adult volunteer leader. The Cubmaster runs the pack meetings and advices other leaders. A group of 6-8 boys who meet at regular intervals. A Cub Scout or Webelo scout elected by his peers to help the den chief and den leader. Amazing adult, enjoys doing all kinds of stuff with boys, even if it involves large quantities of patience. Easily smiles, asks others for help, and uses all kinds of resources to keep smiling--like Roundtables. Each council is divided into a number of districts. After the Achievements in the Wolf and Bear book. Can be done any time by a boy, and count toward Arrow Points after the Wolf or Bear badge have been earned. Can be repeated, if boy does his best every time. International Boy Scout Emblem. Also used by New Orleans football team. Some Scouters even have boxer shorts with this on them. Friends of Scouting. Donations to support the camps, materials, special events, and the professional coordinators who help make Scouting possible. Largish post-Cub Scout person, good for helping boys with tools, fire, and holding things while boy plays. Good candidate for leader. What happens when boy says “I did it!” after trying very hard. Semi-chaotic gathering of boys where much fun and some learning happens, usually helped along by Den Leaders and Grown-ups. For Tigers, each Tiger Cub and his partner get to host a meeting in turn. Everything for a Tiger Cub! Learning about others, working with his partner, and finding out about the world around him. New things are things to Search--Discover--and Share for the whole Tiger Cub Den. The whole group – all or our dens and families together is called a Pack. The pack usually meets once a month. A pack racing competition, where Cubs and their parents work together to make model pinewood derby cars and compete for prizes. What leaders try to deliver. To do their Best, to help others, and to help boys learn to Do Their Duty to God, Country, Family, and self. Someone who may or may not have boys in Scouting, but just really loves the program and gets satisfaction from helping boys grow to men. A parent, big brother or sister, uncle or grandparent, or anyone who joins with a Tiger Cub to help him Search, Discover and Share the world as he plays and does things with other Tigers and their partners. Adult liaison between Tiger Cub parents and the Pack. Our Tiger Coach is Don Capps. Most anything you’d never think of. Juice can lids and tissue tubes, bits of string, wood, packing peanuts, wheels, marbles, frosting containers, and whole bunches of stuff tha make great craft supplies! What a boy wins every time he does something he really had to try at, even if he doesn’t go the fastest or highest or whatever. We’ll Be Loyal Scouts. Also, boys in 4th and 5th grade. Sometimes wear the khaki Boy Scout uniform (means he outgrew the blue one). Works on Activity Pins, camps, goes on hikes, prepares to be a Boy Scout. Old hand at this Cub Scout business--can build a Pinewood Derby car blindfolded. Cub Scout in 2nd grade. Incredibly cute in blue uniform and new yellow neckerchief. Full of life and enthusiasm, eager to learn all about Cubs. Symbols for the unknown. Not even Akela knows all the answers!